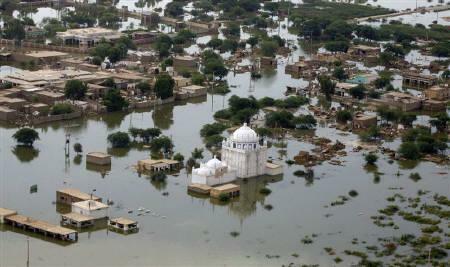 The monsoon season of 2011 will start in just 2 months across the Sub-continent. The monsoon bring much awaited relief from the heat waves of May and joy to local farmers but is also brings death and destruction in this region of the world. So what basically is Monsoon? The word “monsoon” is derived from Arabic and Urdu words of mawsim (موسم) meaning weather. The English used to use this word to define a seasonal prevailing wind in the region blowing from the south-west between May and September and bringing heavy rainfalls to British India (India, Pakistan and Bangladesh). The La-Nina which occur in Pacific Ocean have impact on monsoon. In 2010, La Nina was one of the positive factors to have caused good monsoon across the Indian Subcontinent . The La Nina condition which prevails even today is gradually weakening. As per Global Model, La-Nina condition will continue till May-June. 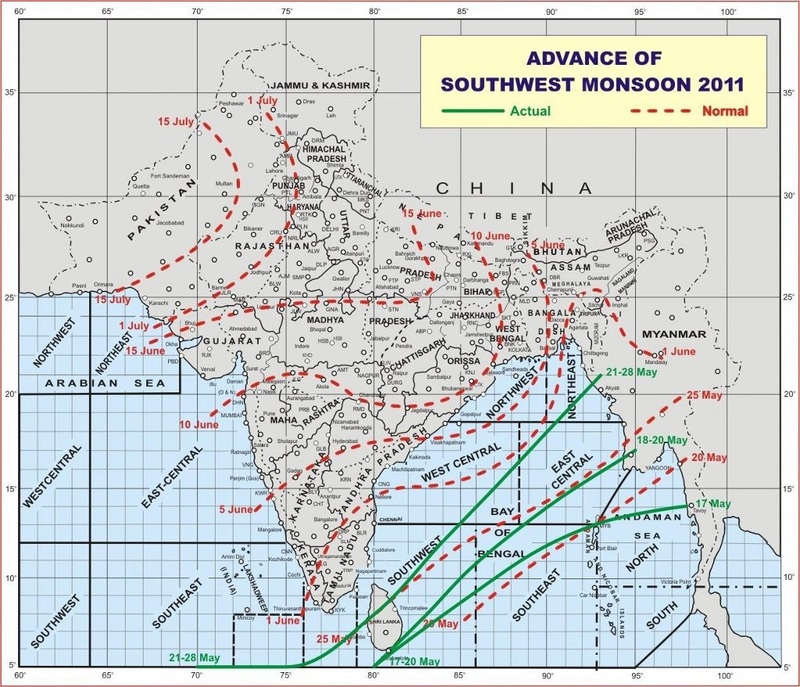 Therefore a normal monsoon is likely in 2011. Each year before the onset of monsoon that is 15 April to 15 July and also after its withdrawal that is 15 September to 15 December, there is always a distinct possibility of the cyclonic storm to develop in the north Arabian Sea. Karachi, Sindh coast and Gujarat coast in India are the likely target of these cyclones. El-Nino is also spanish word which means boy. It is the complete opposite of La-Nina. 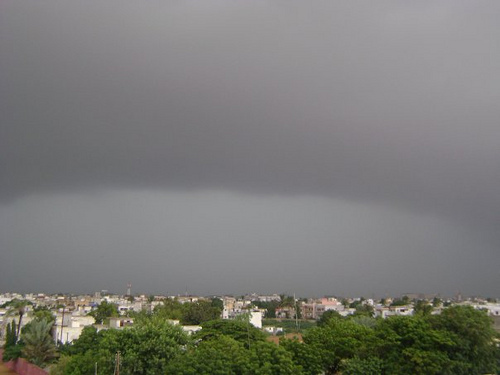 It caused severe drought in India and Northern parts of Pakistan in 2009 till early 2010 but unusually Hyderabad and Karachi in Pakistan received record-breaking monsoon rainfalls but that was an isolated event. La-Nina is a spanish word which means girl. It is a global phenomenon which causes wet and cool conditions in the Sub-continent and other parts of the world. But some parts become dry due to La-Nina. In 2010, some countries witness major floods included Australia, Pakistan, Srilanka, Brazil etc and America witness increased hurricane activity that was all due to La-Nina. The La-Nina started in late June 2010 and will end in late June 2011. The last time this phenomenon occurred was 2003. What could happen in Pakistan? In 2010, Pakistan witness a slow moving "tsunami"
Due to La-Nina, winter rains are still lashing the country in the month of spring which should have been some what hot and dry. Hail storms and snow have covered the mountainous region of Pakistan. If temperatures soar high in the month of May and June, which will definitely happen. Then floods can’t be ruled out keeping in mind that hot summer and monsoon rain accelerates the flood process. Due La-Nina, there could be no cyclone in the Arabian sea this year due to cool temperatures so Karachiites could rest this year and Abdullah Shah Ghazi does not need to worry. The Governments of India, Pakistan and Bangladesh should start cleaning all drainage system to cope up with their citizens difficulties. Early warning should be given to help save lives. When riding a cycle or bike, drive slowly during rainfall. We Pakistanis should also listen to our governments as when they give us weather warning, like last year when Cyclone Phet was expected to hit Karachi, half of the population of Karachi went to the beach to welcome the cyclone. Even before monsoon there is too much precipitation everywhere in South Asia except Karachi,sindh and other Arabian sea sided areas like Trivandrum to Mumbai and jamangar. Even before monsoon there is too much precipitation everywhere except Arabian sea sided areas is unable to understand. It seems that even this karachi will not get meaningful rains even it seems this year also that Big Arabian sea will not get precipitation. On the other hand western disturbance every year atleast 6 months creates downpours all pakistan except karachi and sindh. Nothern India also get benefit from it. Even before monsoon there is too much precipitation everywhere in South Asia except Karachi,sindh and other Arabian sea sided areas like Trivandrum to Mumbai and jamangar. Even before monsoon there is too much precipitation everywhere except Arabian sea sided areas is unable to understand. It seems that even this karachi will not get meaningful rains even it seems this year also that Big Arabian sea will not get precipitation. On the other hand western disturbance every year atleast 6 months creates downpours all pakistan except karachi and sindh. Northern India also get benefit from it. Karachi Metro – Another good post! Send me your email address so we can stay in touch – on another note, would it be okay if I forward some of your alerts and posts to my mailing list of Karachiites? P.S. Would you like to do some posts together on Prevention and Preparedness? Its little too early to say what if 2011 monsoon will bring floods or not…but urban flooding in Karachi, Lahore, Islamabad could occur..isolated flash floods can not be ruled out!